SFC/ Scannow – We all Windows operating system users might have faced one issue most of the time that is getting corrupted files on our Windows PCs or Laptops. There might be lots of reasons for it and it comes anytime on our Windows OS PCs. It can interrupt a Windows system, gradually or with no time. Though plenty of options are there to fix Windows System Corrupt files, a Windows Operating system user can easily find Windows System Corrupt file fixing tools on your PC/Laptop. But by using Windows Command, a user can also fix some corrupted system files, and with Windows Command Prompt, there is an SFC command to fix it. You might also be interested in learning How to run programs without installing them in Windows. So before going deep into the explanation of the method, first let’s know about the SFC/ Scannow system in detail. The SFC is a short name of System File Checker, that finds all the possible file, verify, scan and fix them. 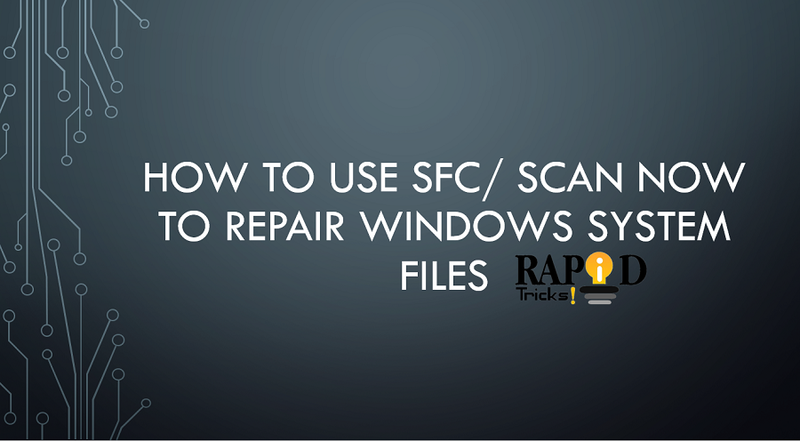 Today you are going to learn with our detailed in-depth guide on how to use SFC Scannow to repair Windows System Corrupt file. With the Scannow feature in SFC Command Prompt, a Windows user can also check invalid DLL files. Once you check the issue on Windows System, it will replace a protected file and fix it. But to do so, a Windows user should know how to use SFC Scannow to repair Windows System Corrupt file. As this is the easiest and safest way to fix the error that comes by default in Windows Operating System. If the same thing again comes to you, then fix this corrupted Windows System file, which you might need to spend some money for the third party programs. So, check how to use SFC/ Scannow to fix Windows System Corrupt File error by yourself. How to Use SFC Scannow to Repair Windows System Corrupt Files? To fix all the Windows System Corrupted using Windows SFC Scannow which is quite easy and you need to follow some technical terms to get it done easily. But make sure you are much aware of one factor the terms wisely without missing a single step. In the first step, on your Windows PC, you will need to open one Windows Command Prompt window, and some plenty of options are there to open Windows Command as well. You can find the Windows Main Menu search bar and be using combine keys. If you don’t know how to launch this Windows Command, then follow below process. Tap on the Windows icon or directly tap on the Windows button and if your PC is running on the Windows 7 then you will get the search option below of the Windows Menu for the upper Windows OS, simply tap on the search icon and you will get search result to search command. Later, check the search bar on your Windows PC, you will have to provide Command Prompt keyword in the search bar. The related result will pop out to you and now you can easily run Windows command prompt, but to launch SFC Scannow Command, you should run it as administrator privilege. Now in the Windows Command Box, you need to enter the SFC/ scannow and then press enter. System scan will begin in no and you will need to wait for few seconds to complete the system file checker/scannow It will automatically fix all the errors in the system that you will be notified when it is done for sure. So, now this is how you can use and run SFC and fix all the PC errors on Windows PC/Laptop. But if your Windows doesn’t have any protected file of an error file then it will be failed to fix them one by one. However, in most cases, Windows does have protected files and fit it in System File Checker process. If your PC fails to fix some errors with the Scannow command, then there is another method fix manually. Basically, unresolved files report will be included CBS[dot]log file or follow the directory as C:/Windows/Logs/CBS/CBS.log. For the unfixed logs, the CBS[dot]log would be helpful to restore system files, and soon after the System file checking scannow process, when there are some unfixed files will be there you can run the below-mentioned method. You will be shown “Windows Resource Protection Found Corrupt File but Was Unable to Fix Some of them”. To run System Health, make sure there are unresolved files after the SFC Scannow Windows 10, and later you will have notified the resolved note type the same word as “DISM/Online/Clean-up-Image /RestoreHealth” or you can directly copy the same from here and after pasting in the Windows SFC Scannow command, press Enter. That’s it, now it will surely fix Windows System Corrupt file, that might take time. Note: Depending on your PC performance execution time of SFCScannow can vary and user needs to make sure your PC/laptop is connected to a power supply. So, your system file can get corrupted that you can fix with Windows integrated feature. That feature is known as System File Check, that also abbreviated as SFC Command, with the SFC you can run Scannow to Fix OS file automatically. However, most of the Windows user doesn’t know about this feature and tend to use third-party software’s but it is always a good step to obtain with own system restoration tools. So, we hope you found this informative guide on How to Use SFC/ Scannow functionality and you can share it with your friends and family who uses Windows PC/Laptop regularly. It will help them to recover their PC without spending a single penny anywhere.